​Afro-Colombian women dressed in brightly-coloured skirts and blouses with their heads wrapped in scarfs are selling fresh tropical fruit in Plaza San Pedro Claver. I buy some mango from one, and she slices it for me. I dig in, juices dripping down my fingers as I sit with the others, tourists and locals, on the cathedral steps, watching children playing, eating ice cream, feeding the pigeons. All of us are appreciating the rich ambiance created by the contrast of the Cathedral on one side of the Plaza—so rich in history you will find the actual remains of Saint Peter Claver, the first canonized saint in the West there--and modern sculptures and contemporary outdoor patios and restaurants on the other side. This contrast epitomizes Cartagena , this tasteful mix between the colonial and the contemporary, with a strong dose of exotic Caribbean influence and bright colours dotted throughout. Unlike grey, rainy Bogota, only an hour’s flight to the south where I’ve arrived from that morning, in Cartagena the humidity and heat are pleasant. En route from the airport, my taxi wound alongside the sparkling blue waters of the Caribbean, and as we drove through Las Murallas, the thick stone walls that surround the Old City, I glanced to the ocean, expecting to see pirate ships on the horizon. Later I walk atop this wall and find a table at Café del Mar to sip a glass of wine at sunset, enjoying the view and feeling the ocean spray against my skin. 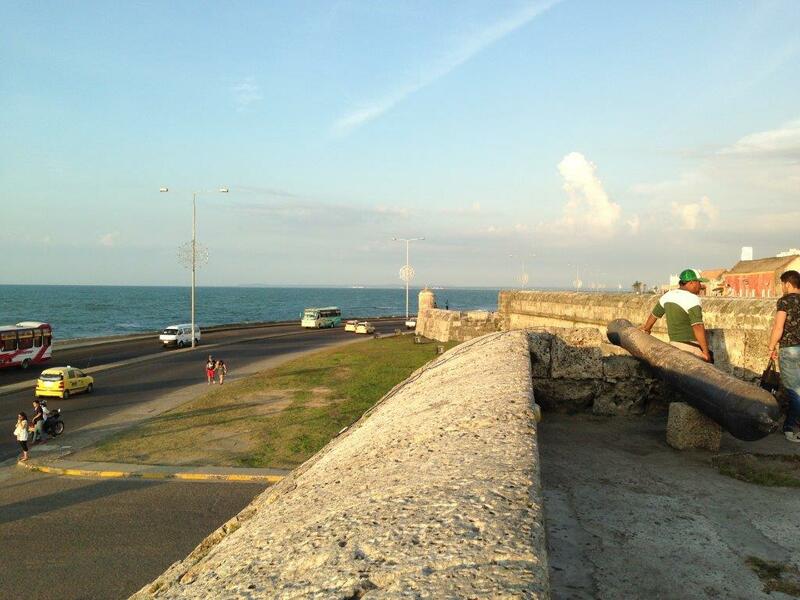 ​I learn Cartagena was designated as a UNESCO World Heritage site in 1984 for its four kilometres of fortress walls, still studded with cannons and towers, which were painstakingly constructed over two centuries. It was the most extensive military fortification in South America and remains one of the most complete. The city was originally discovered in 1533 by the Spanish and named after Cartagena, Spain. As a port, it became wealthy due to its resources of gold, silver and emeralds, but these also made it attractive to pirates and other countries who were vying for its control, hence the fortification. There are also strict historical preservation laws for buildings. My hotel, Casa India Catalina, is a small boutique hotel that was once a historical home. Like many properties in the Old City, there are no street-level windows, only a door with a knocker. What’s inside is not apparent from the street. So when I see a courtyard with palm trees and a small pool, and two stories with balconies looking over the court yard, I am surprised. My room décor is a tasteful mix of antiques and Botero prints with touches of modernity, like glass showers and contemporary bathroom fixtures. Donovan Mendoza, the smiling front desk receptionist, tells me that when the hotel opened its doors in 2007 there were only ten boutique hotels in Cartagena, but as this accommodation style gains popularity, that number has more than doubled. ​Outside my hotel each turn is like Christmas, a delightful discovery down every street and cobblestoned alley—16th and 17th century colonial mansions, an old convent, cathedrals, balconies draped with tropical flowering vines and bougainvilleas, peppered with modern additions like Juan Valdez specialty coffee shops, art galleries and museums, and a Hard Rock café. ATMs are easy to find, and when I need a supermarket there’s Éxito, selling everything from groceries to electronics. The block long El Portal de los Dulces (sweets portal), where there are at least 12 carts selling traditional sweets in old-fashioned glass jars, is a sweet-tooth’s dream. There is an international feel, and I hear languages from all over the world being spoken, but I appreciate that the bulk of the tourists are Colombians, after all I am in Colombia. Rounding the corner to busy Plaza de Bolívar, named after Simón Bolívar, a name you will see often in Colombia as he was instrumental in the liberation of the country, jewellery, leather goods and arts and crafts are being sold on the street. 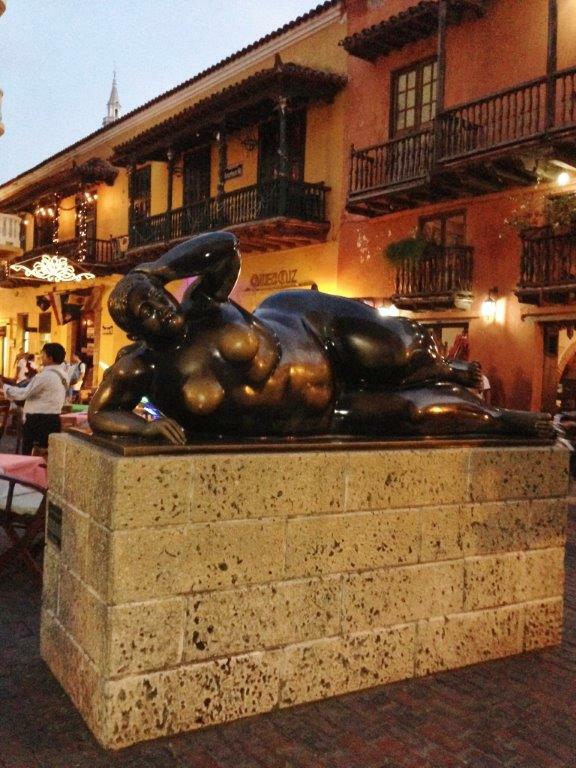 A Botero print with its enhanced-proportion subjects catches my eye, and I buy it. I browse boutiques selling high-end designer clothing and beachwear, souvenirs and, of course, stores dedicated to selling gold and emeralds, a Colombian specialty, each promising a better price than the other. I’ve decided to study Spanish this trip, and my first day of classes at Babel Spanish School I cross through the wall under the 19th century landmark Puerta del Reloj (clock tower) to the trendy neighbouring district of Getsemani, historically where artists and slaves lived. It’s a lively place at night, especially the club strip called Media Luna or the Plaza de la Santisima Trinidad, where I join some classmates one night. Groups of people sit around watching the street performers, chatting and laughing, drinking coffee or beer from the liquor store across the street, some sharing bottles of anise-flavoured Aquardiente, the national drink of Colombia. Aguardiente means hot water or fire water, and after I try a sip I decide I agree with the second translation. As the evening progresses, an entrepreneurial Colombian rolls in a small portable bar cart, complete with blender and plugs it into a power outlet that pops out of the bottom of a tree. He makes me a strawberry margarita, and not from a mix, but with fresh strawberries, at a cost equivalent to $2. Donovan has assured me that exploring anywhere alone in the Old City, any time of day is perfectly safe, and I find this to be the case. 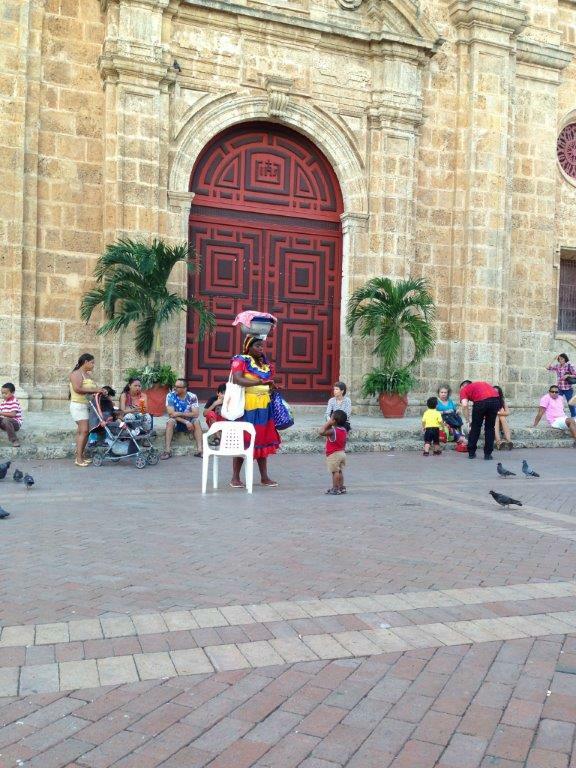 Despite the population of Cartagena being about a million, in the Old City you get a small town feel. I learn the other parts of the city require more caution at night and taking a taxi is a must. 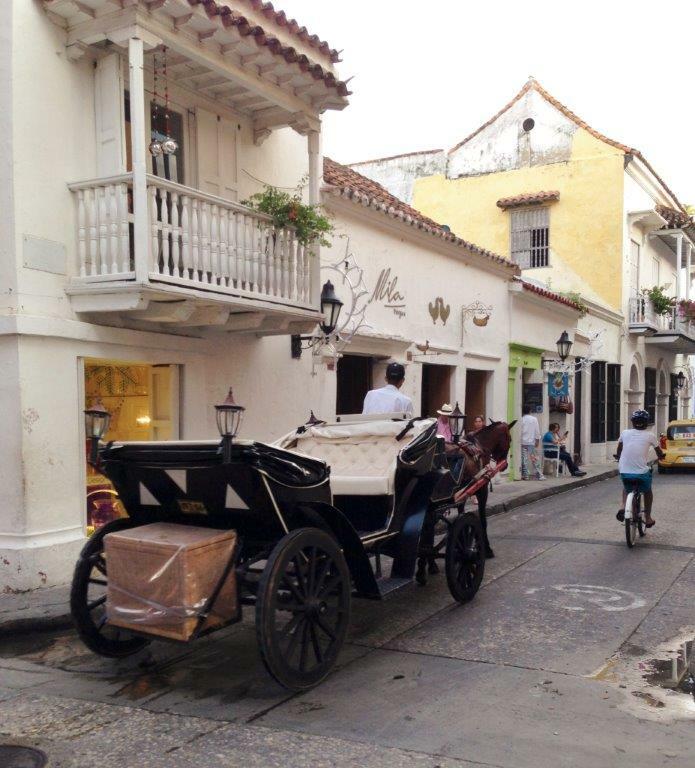 Taxis are easy to find, and many of the streets in the Old City are accessible only to taxis or the horse-drawn carriages that are everywhere. But it’s really best explored on foot or on the bikes you can rent. ​Night time is a pleasant time to explore with the cooler temperature, and the city takes on a look of enchantment with lights twinkling everywhere--on trees, plants, buildings. Making a decision where to dine is difficult with so many choices, street vendors selling traditional foods like empanadas or arepas (a must-try--maize cakes filled with meat , cheese or potato), or gourmet, like La Cevicheria (featured in Anthony Bourdain’s “No Reservations”), and restaurants featuring world cuisines like Italian, French, Peruvian, or Colombian fusion. Before calling it a night, for a dose of real Colombian flavour, a salsa dance bar is the place to go. Colombia has its own unique style of salsa and every Colombian can dance it well. Tourism in Columbia is growing by leaps and bounds, up by more than 160% since 2004, and the government is injecting millions of dollars into updating infrastructure and systems. Despite this, many people still have a lot of trepidation about visiting Colombia, an unwarranted bad rap at this point, in my opinion. But on second thought, maybe I shouldn’t want people to discover what a gem it is, because surely, more tourist traffic will change the unique flavour of Cartagena.